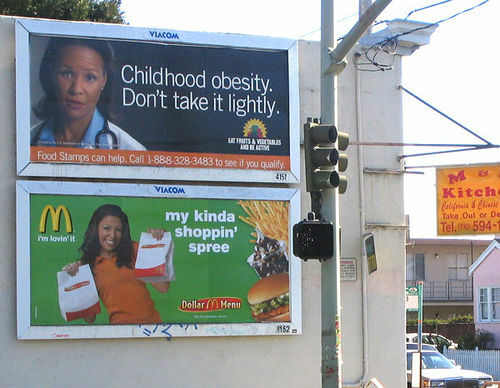 Either a serious case of spiteful humor overcame the Viacom posting crew or human stupidity, as it so often does, reared its uneducated head with this odd placement of a McDonald's billboard directly beneath a childhood obesity billboard. All we say is thank God for the proliferation of digital cameras so we can revel in the oddities and wonders of advertising. Yeah and thank Him for photoshop while your at it. No Photoshop necessary--I took the photo in Oakland, CA, and sadly, it's real. You can view the original on Flickr. A few days after I took the photo, they replaced the obesity ad with an asthma ad that features an adorable kitten.